The image above shows the current iPhone, a mockup of the alleged 16:9 phone, and a mockup with a bigger 3:2 screen at 300dpi, which measures 3.84” diagonally. I estimated that the physical size of the phone would need to increase slightly, getting taller in the 16:9 version and wider in the 3:2 version. I don’t think either of these size increases are deal breakers. 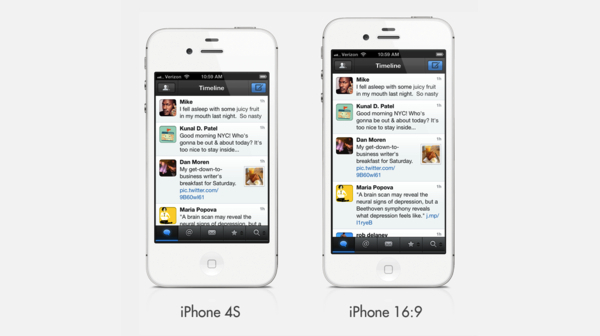 The 3:2 version is actually still narrower than the iPhone 3GS. Changing the aspect ratio of the iPhone would ultimately change the device's experience, and developers would have to rework their apps for 16:9. Keeping the existing 3:2 ratio, lowering the pixel-per-inch count to make for a bigger screen, would still see some developers needing an optimization of their apps, but it'd have less consequences on the iPhone experience users are now accustomed to. And, aside from apps, let's not forget that many websites have created custom mobile layouts specifically built for the iPhone's 3:2 ratio. The same question I asked for the rumored 7.85-inch iPad applies here: why would Apple want to change the iPhone's screen? Apple doesn't "have to" consider bigger screens just because its Android and Windows Phone 7 competitors are doing it, so unless Apple finds value in having a bigger iPhone screen, they won't do it.